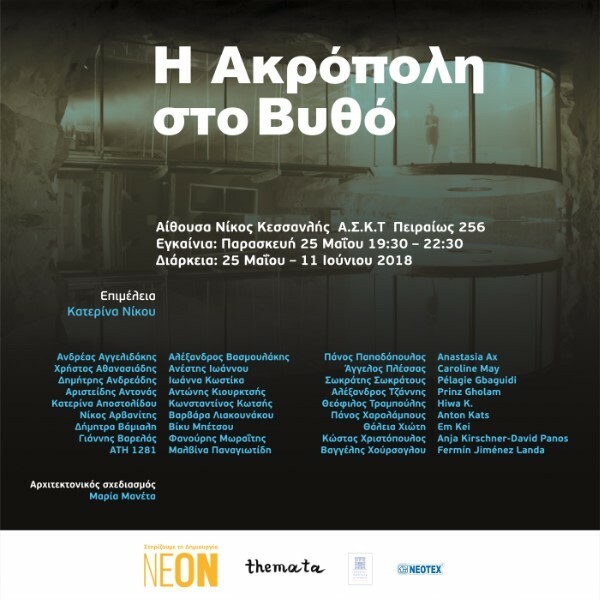 The exhibition titled The Acropolis at the Bottom is based on the so-called citadels on ships which are security rooms hidden in warships or even in large commercial ships and vessels. According to the terminology of navigation, citadel (in Greek acropolis or castle) is a fortress where people can find shelter during war, piracy or during an external danger in general. They usually have weaponry and a special ventilation system to make possible for someone to stay there. In many cases, they are in a very well-hidden place on the board that cannot be detected by the external danger and the door is locked and unlocked only by the operator who handles the remote control. The operator can immobilize the vessel to prevent any kind of movement from the external threat. The cost of their construction is excessive and in cases where this is not possible, a similar room is formed accordingly at the location of the ship's engine. The exhibition attempts to define differently the notion of fortress, boundary, border, memory, habitation, exclusion and encroachment in relation to the collective and the individual sphere. In a time of unstable values and constant changes in social parameters, the position of the individual and of the whole is defined by a precarious condition in which social values are at stake. As Lars Bang Larsen states (The Society of Social Qualities)….the idea of society without qualities is an indictment of a state that fails to provide a quality for its citizens. The society without qualities is one which a systemic pressure on cultural and democratic institutions results in whittling down of civil liberties…And so the idea of the state as a caretaker and an educator, an alleviator of pain, is no longer believable. Taking as a fact the existence of an Acropolis at the Bottom, the exhibition raises questions about the economic, social and political situation of today. What can happen when a group of people is forced to live in a box in the water? What does danger mean in contemporary society? What can contain a box that traps people into a situation? What is an external threat? Acropolis at the Bottom encodes contemporary artistic practice as a system of signifiers where the personal and the collective are unified. Consequently, a society at a stake influences to a great degree the artist’s position, expression and their work inside a heterogeneous space but in the time frame of contemporaneity. The participants detect the boundaries of coexistence, the causes of expulsion, as well as the networks, borders and structures that fragment or unite us in space and time.